So... let me tell you a short story (very much out of order of a larger story). I adopted a Greyhound. He's awesome. Seriously. He is. Even though I've only got to hang out with him for about 20 minutes. He's awesome. And I'm picking him up from his foster family on Friday. Nothing about that is dramatic. 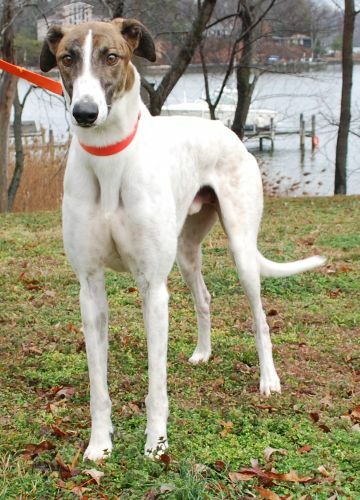 Dramatic: This Greyhound's name is Pal's Spot Light. Y.U.C.K! Teh Bear and I had decided we were going to rename him, and we were working with S names because we figured he was called Spot Light. Only spent 20 minutes with the dog, cut me some slack. 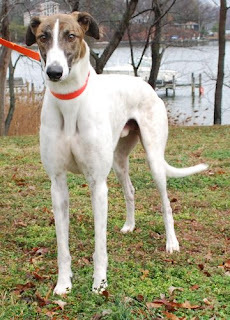 Greyhounds aren't usually "called" by any particular name since they aren't really "pets" until they retire, which is when they start getting called by a name and being a pet. We finally decided on Sprocket, cause that was cool. We liked Spock for a while, cause that's all nerdy. Apparently, Sprocket was also nerdy in a way that I didn't understand. Then I called the foster mom and she said that she'd been calling him Pals because he seemed to be responding to that better than Spot or Light or any combination. Which meant that Teh Bear and I were back at square 1 with a name. In reality, we could still name him something entirely different from a name that he is answering to, its only a matter of training and time. But for my sanity's sake, I wanted something similar to something he was already answering to so the transition could be fairly smooth. So we started brainstorming P names. Photo reminder of the cuteness in question. We've been pretty torn about this re-re-name. I liked Pixel the best. But we came up with a list. I think Teh Bear really liked Phil, which could grow on me. But time is dwindling and I'm ready to make a decision on this dog naming business. Teh Bear left MD today (/sad face), so now I have all this quiet time on my hands to write blogs and contemplate dog names, but I need help with the 2nd part!